Description: 110 epoxy glue is a two-part putty type glue with an epoxy resin base. The part 1 resin is milky white. The part 2 hardener is amber. Both components are about the consistency of vaseline. The glue which results from equally mixing the two components is the strongest. yet developed by science. 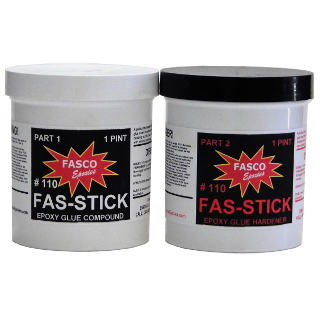 Uses: Body repair sealant, bonding trim, brake linings, repairing gas tanks, gluing radio parts, tough marine glue joints, cabinet shops, gluing glass to aluminum, assembly and repair of fiberglass products, gluing together foam products and many other glue applications limited by your imagination.